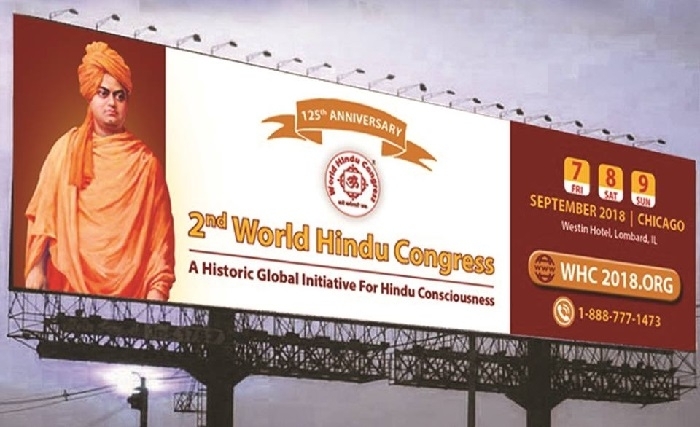 Chicago, Sept 7: The City of Chicago is all set to witness the much celebrated World Hindu Congress (WHC) beginning from September 7. During this three-day international convention, leaders from different walks of life will deliberate on the issues pertaining to the welfare of world’s largest community. The grand event of World Hindu Congress is taking place on the background of the commemoration of 125 years of Swami Vivekananda's historic address at the World's Parliament of Religions in Chicago. Veterans like Vice President M Venkaiah Naidu, RSS Chief Mohan Bhagwat, Spiritual leader and Art of Living Founder Sri Sri Ravishankar, Dalai Lama and several intellectuals will address different sessions in World Hindu Congress. If reports are anything to go by, 2,5000 delegates from 80 different countries along with 250 speakers will pitch their ideas on subjects like economics, education, media, politics, and women and youth. Besides Venkaiah Naidu and Bhagwat, Dattatreya Hosabale, RSS joint general secretary, noted economist and former NITI Aayog Arvind Panagariya, MIT professor SP Kothari, renowned thinker and author Rajeev Malhotra, and Francois Gautier will mark their presence at WHC. Famous film personalities like Anupam Kher, Madhur Bhandarkar, Vivek Agnihotri, Young novelist, Amish Tripathi will grace the occasion. Entrepreneurs like Mohandas Pai, Daniel Bryant from Walmart, Rajesh Sundaram from Federal Express, and Ed Monser from Emerson Electric will share their vision for global trade and technology. The three-day global conference will conclude on September 9.